After much of the Midwest recently received a ton of snow, and with more snow in the forecast, it’s important to know how to remove snow carefully (and how you can use it to your advantage). We put together a list of tips for how to remove snow safely and how to incorporate it into your day’s fitness plans! You may groan when you see inches of the white stuff in your drive, but shift your focus: instead look at it as a way to burn calories and use muscle groups effectively. These aren’t just “mirror muscles” – this is what your body is supposed to do: lifting, pushing, moving, etc. If you’re out in the drive and front walk for a good half hour or more, you can burn up to 200 calories. Depending on how hard you work, you may be able to get even more out of it! You’re also engaging muscles you may not use in your normal routine or workout. • Treat it as a workout and dress accordingly. Since you’ll most likely be working in cold temperatures, wear layers, but be sure the layers closest to your body are moisture-wicking. • Warm up the way you would before a workout, so you don’t go from zero to sixty with cold muscles in an unfamiliar movement pattern. Do some gentle stretching and walking before you dive right into getting rid of all that snow. • Still using grandpa’s shovel? These days, you can find shovels designed to push snow, and those designed to save your back! Look into upgrading your shovel. • If you’re lifting the shovel, don’t lift with your back. Remember, treat it as a workout and watch your form. Otherwise, you could end up with a clear drive and a sore back. Be sure and tighten your core and bend your knees. • Don’t try to get too much snow on the shovel; it may not look like much, but snow can be heavy. 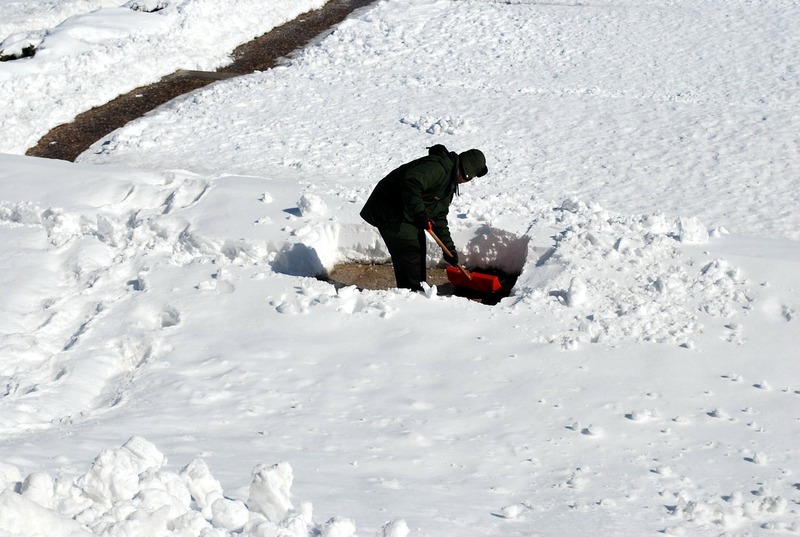 Use lighter, more frequent shovel-loads to remove it. • If snow is expected throughout the day, plan a couple removal “workouts.” It’s easier (and quicker) to remove the lighter snow than once it’s settled and heavy on the ground. • Even if you’ve traded your shovel for a snow-blower, many of those are cumbersome and heavy. Be sure that you’re watching your form and being careful as you push and haul it around the driveway and walkways. • If you’re feeling fatigued, take a break – just like you would at the gym or during a workout. Go inside, warm up, grab some water, and stretch. You can even set a timer for 20-30 minutes. • As with any workout, stay hydrated! Just because it’s cold out doesn’t mean your body doesn’t require hydration. If you’re feeling thirsty, take a break and grab some water. Snow Shoveling Warning: As always, if you’re not healthy enough for vigorous activity, pass on snow shoveling. Find a helpful neighbor or enterprising young entrepreneur who might want to make some fast cash. Every year, people suffer injury and even death trying to shovel their driveways and walk-ways, not realizing how labor-intensive it really is. If you aren’t physically fit enough to handle strenuous physical work, be safe and skip shoveling snow this winter. Need help getting into shape for shoveling snow or other daily activities? Body One Physical Therapy is Indiana’s go-to physical therapy team. We’re locally-owned and operated, with four locations serving Central Indiana: North Indianapolis, South Indianapolis, Fishers, and Zionsville. Our caring, experienced physical therapists work with clients of all ages and activity levels; and we’d love to add you to our list of satisfied, happy, and healthy clients. Don’t accept living in pain and with limitations, call Body One today and let us help get you on the road to health and wellness!